Winter Sky by Patricia Reilly Giff. Review: Winter Sky by Patricia Reilly Giff is a book that brings joy and fear for the character and reader. Siria is a brave, noble little girl who isn't one to be messed with. Her dad is a firefighter who has risked his life to save others. Siria, named after a star only known to come out during winter, is the daughter of a brave firefighter. Her mom has died, and she is living with her Pop. He is brave, but Siria doesn't want him to get hurt. Every time the sirens go off, she rushes out to chase the big fire trucks so she can watch them and give them luck on the job. One day, her pop gets hurt, and Siria gets caught when she rushes to go see him. He is in the hospital until he can get better, which will be by Christmas Eve. In that time, she finds a puppy and solves a mysterious fire crime she accidentally blames on her friend. 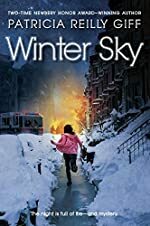 Winter Sky is a great book for anyone who likes reading about action and mystery all in one. It seems like a good book for anyone who can understand the situation of the character. Even though she does get in trouble, it's for a good reason. It helps you see how it helps to be brave and not scared to do what you think is right. Sooner or later, it will all pay off, just like in the book Winter Sky by Patricia Reilly Giff. We would like to thank Random House for providing a copy of Winter Sky for this review. Have you read Winter Sky? How would you rate it?